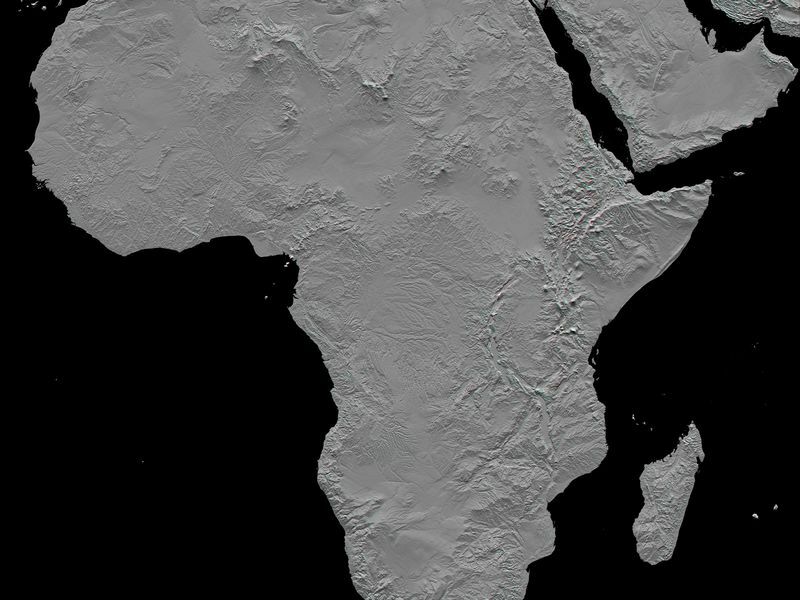 This stereoscopic shaded relief image shows Africa's topography as measured by the Shuttle Radar Topography Mission (SRTM) in February 2000. 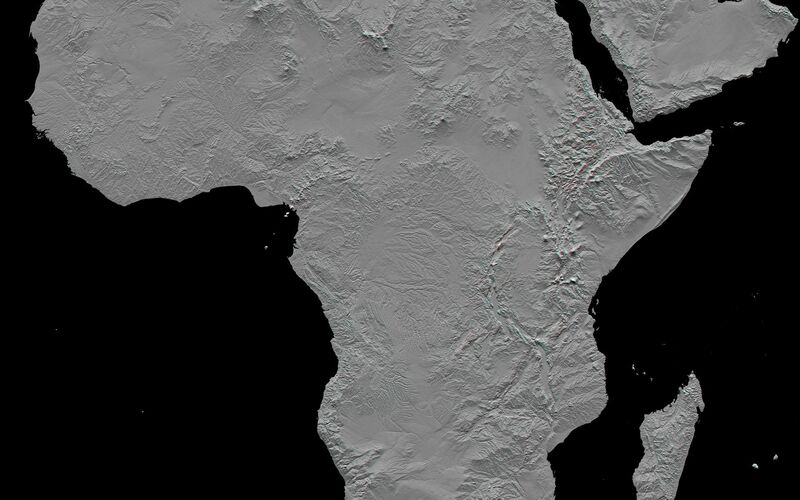 Also shown are Madagascar, the Arabian Peninsula, and other adjacent regions. Previously, much of the topography here was not mapped in detail. Digital elevation data, such as provided by SRTM, are in high demand by scientists studying earthquakes, volcanism, and erosion patterns and for use in mapping and modeling hazards to human habitation. But the shape of Earth's surface affects nearly every natural process and human endeavor that occurs there, so elevation data are used in a wide range of applications. 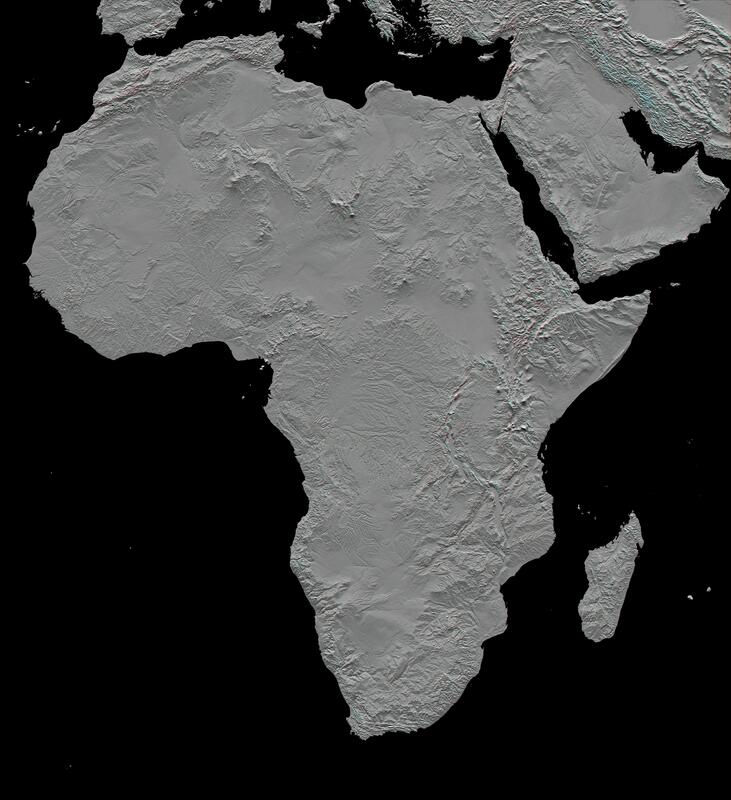 The image shown here is greatly reduced from the original data resolution, but still provides a good overview of the continent's landforms. It is best viewed while panning at full resolution while using image display software. The northern part of the continent consists of a system of basins and plateaus, with several volcanic uplands whose uplift has been matched by subsidence in the large surrounding basins. Many of these basins have been infilled with sand and gravel, creating the vast Saharan lands. The Atlas Mountains in the northwest were created by convergence of the African and Eurasian tectonic plates. The geography of the central latitudes of Africa is dominated by the Great Rift Valley, extending from Lake Nyasa to the Red Sea, and splitting into two arms to enclose an interior plateau and the nearly circular Lake Victoria, visible in the right center of the image. To the west lies the Congo Basin, a vast, shallow depression that rises to form an almost circular rim of highlands. Most of the southern part of the continent rests on a concave plateau comprising the Kalahari Basin and a mountainous fringe, skirted by a coastal plain that widens out in Mozambique in the southeast. Specific noteworthy features one may wish to explore in this scene include (1) the Richat Structure in Mauritania, a "bull's eye" geologic structure, (2) the Velingara Ring in Senegal, a possible meteorite impact crater, (3) the delta of the Niger River in Nigeria, (4) the Cameroon Line of volcanoes, crossing Cameroon and extending offshore, (5) long linear mountain ridges crossing the southern end of Africa, (6) Mount Kilimanjaro and neighboring volcanoes in Kenya and Tanzania, (7) the Afar Triangle in Ethiopia, Djibouti, and vicinity, where Earth's crust is being pulled in three directions by tectonic forces, (8) the Dead Sea fault line, between Israel and Jordan, (9) ancient shorelines, inland from the coast of Libya, and (10) vast seas of sand dunes, particularly across the Sahara Desert and much of the Arabian Peninsula. This anaglyph was created by deriving a shaded relief image from the SRTM data, draping it back over the SRTM elevation model, and then generating two differing perspectives, one for each eye. Illumination is from the north (top). When viewed through special glasses, the anaglyph is a vertically exaggerated view of the Earth's surface in its full three dimensions. Anaglyph glasses cover the left eye with a red filter and cover the right eye with a blue filter.